← Meet a top author at Brownhills Library this afternoon! 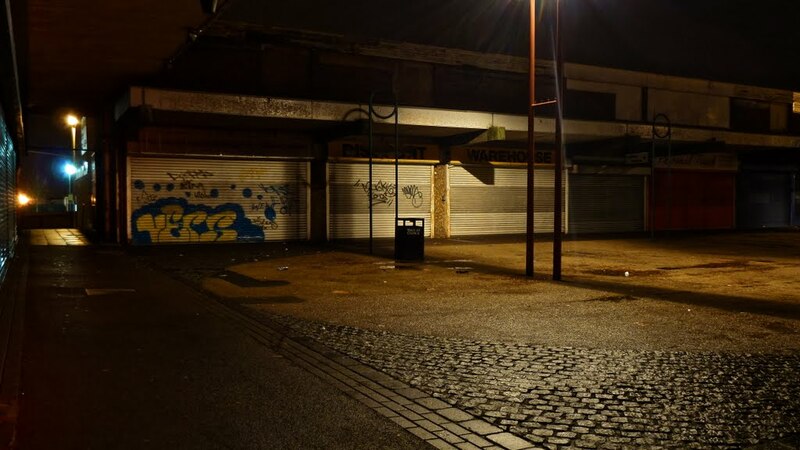 Black is the night that’s descended on the former focus of Brownhills. A good example is the protracted saga of Ravens Court, the derelict shopping precinct in the centre of Brownhills. Once the target of a potential purchase and demolition for a new Tesco store, Tesco unexpectedly pulled out, and now we’re left to deal with the mess the retail giant left behind. Recently, the issue has come to the fore again, as I featured just over a week ago on April 18th 2014 – Walsall Council, after pressure from Brownhills Labour Councillor Steve Wade and others – issued a 215 notice, forcing the owners to clean Ravens Court of rubbish and secure it or face fines. The Walsall Advertiser carried an excellent article on the matter, and I discussed it at some length. It’s hard to see who’d want to develop anything here now. At the time of writing, I hadn’t seen the printed edition, and picked up on the story from the Advertiser website. When I saw the inky copy, it contained the following, somewhat curious letter from local lady and community stalwart, Vivienne Aston. 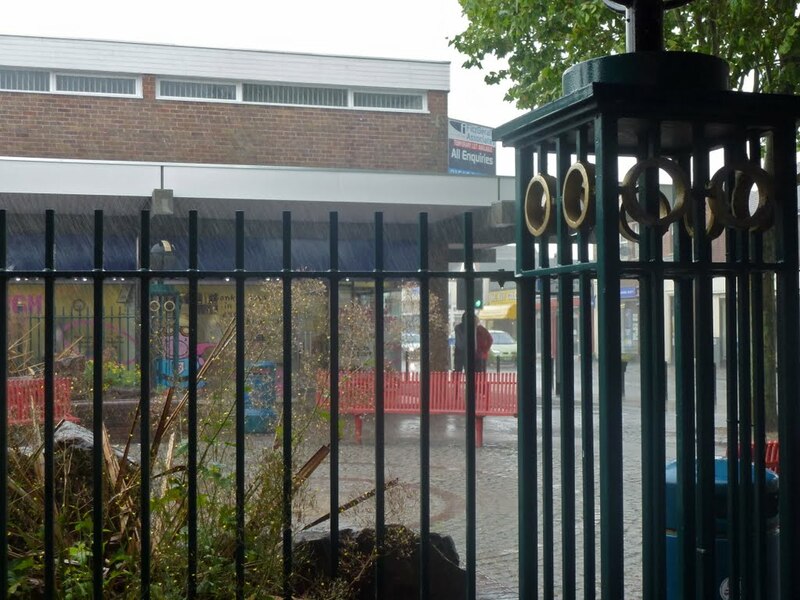 I AM starting a petition with the hope that a thousand-plus Brownhills residents will sign in support of a request to the council to compulsory purchase Ravenscourt Shopping area. This collection of mostly empty shops has been a concern to residents for quite some time. Compulsory purchase is an option which would lead to regeneration. This in turn would transform the appearance of the High Street and make Brownhills a shopping destination for shoppers from outside the area. At face value, this seems reasonable – a petition for compulsory purchase. Then I thought about it. Why now? What could be possibly be the sudden motivation? Where would the council get the considerable sum of money – I mentally estimated about £2 million -and what was the authority supposed to do with Ravens Court when purchased? How would this lead to ‘Regeneration’? Then I twigged; what Vivienne doesn’t mention in her billet-doux is that she’s standing as a candidate for election in the upcoming council elections, taking place on 22d May 2014. Vivienne is standing as a Conservative, contesting the position currently held by Dave Turner, also a Tory. I’d wager that as a Conservative in favour of public spending cuts, Vivienne knows well that Walsall Council isn’t in any kind of position to issue a compulsory purchase order, but would like to appear proactive on the matter. After all, who can blame her for that? I didn’t get time to write about this and my feelings thereupon last week. As it turns out, I’m glad I didn’t, as this weeks Advertiser contained an absolutely belting reply from local campaigner John Bird. MAY I reply to the recent letter by Vivienne Aston in the Walsall Advertiser of April 17, 2014, regarding organising a petition to sort out the shambles that is Ravenscourt Precinct in Brownhills High Street. As she is a resident of Brownhills and I think, attends local planning and regeneration meetings, I would have thought that she would have been fully aware of the fact that a petition, which attracted many hundreds of signatures relating to the very same subject, was organised last year and handed in to the full council meeting in November. This prompted a number of meetings between council officers and the precinct owners and their agents. While progress is slow, at least that particular petition has ‘got the ball rolling’ at last. I am afraid, Vivienne, that you have illustrated publicly, that you are out of touch with local issues in Brownhills. Now let us take a closer look at your proposed solution, namely, for Walsall Council to take over the site using a Compulsory Purchase Order. Have you costed this out? Because a conservative estimate would be in the region of three million pounds, a large sum of money for the taxpayers of Walsall to find for a site, which Councillor Adrian Andrew has said publicly, currently has no national retailer interest. Given this fact, Vivienne, I am not sure what planet you arc living on as anyone can see that Walsall Council does not currently have the luxury of having that kind of money to hand to splash around. In fact, enforced cuts will clearly make this next financial year an even more difficult one to administer-whoever is running Walsall Council. I’ll state here and now that John Bird has written some excellent letters on this subject over the years, sadly, none of which I transcribed, and they don’t seem to be online any more (but references can be found in this post from 2009). I’ve always broadly agreed with him on this stuff, and the letter above is bloody wonderful, even if the predicament we’re in is thoroughly dire. If by chance John Bird is reading this, I’d love him to get in touch, and I make the offer here and now that if he would like to write an article about the issue, I’d be happy to host it; the same invitation is, of course, extended to Vivienne or any other councillor, prospective councillor or community activist. John’s letter explains clearly and plainly the situation, and we need more of that. I doff my hat to him, and have reproduced the exchange here as I feel it deserves wide exposure. Comment here, or mail me: BrownhillsBob at Googlemail dot com. Thank you. This entry was posted in Brownhills stuff, Environment, Express & Star, Followups, Interesting photos, It makes me mad!, Just plain daft, Local media, Local politics, News, Panoramio photo discussions, planning, Shared media, Spotted whilst browsing the web, Walsall community, Walsall Council and tagged 215 Notice, Blofeld, Brownhills, Brownhills local history, Brownhills Market, Canal, Cheap tat, Clayhanger, Compulsory purchase, Derelict, Events, Facebook, John Bird, Lichfield, Local History, Local politics, Mike Bird, New Photos, New Tesco, planning, Politics, Ravens Court, Redevelopment, Retail, sympathy, Tesco, Tesco Development, teve Wade, Vandalism, Vivienne Aston, Walsall, Walsall Advertiser, Walsall Council, Walsall politics. Bookmark the permalink. To give some perspective on the potential cost of the site, Burntwood Town Shopping Centre was sold recently for £2.12m and that has 26 retail units of which 4 were vacant. 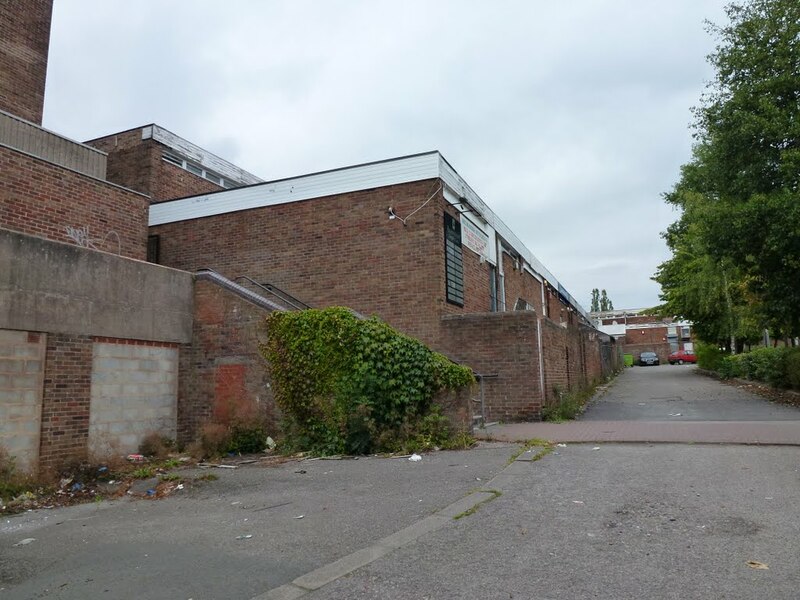 I would estimate that the almost derelict Ravens Court site would be in the region of £750k to £1.25m as it would need significant development to make any return. The unit on the corner is currently for sale at somewhere around 210k freehold. I think your estimate is maybe a tad low. The issue with cost is that of issuing the CPO, of course, and here, apparently against multiple owners (at least three, as far as I can tell). CPO are expensive to administer. It’s a non-starter with no return. I Agree on the CPO being a non-starter. The corner unit has a tenant so would give an immediate return. I would imagine that very little if any maintenance has been done on the vacant units and they would need significant investment before they could be let. That is assuming it wasn’t more cost-effective to demolish and start again, in which case the value is for the land not the buildings. The usual practice, these days, in making compulsory purchase work is known as “back-to-back”. Essentially, this occurs where a developer has a viable, deliverable scheme that would fulfil a clear planning purpose (an objective in the development plan) or some other statutory need. The purchase by the Council and selling on to the developer, at no overall cost to the Council take place immediately one after the other. In effect, the developer borrows the Council’s compulsory purchase powers at its own expense. The difficulty, apart from the clear planning or other purpose, is that any development scheme would have to overcome an initial deficit of £2 million or more plus legal costs, which could be substantial if the current owner contests the purpose or valuation in the courts. The obvious planning purpose, especially in the light of current national policy, would be residential development, but the site acquisition cost looks prohibitive for a private market only development, and the grant required to secure an affordable housing component would be hard to win, given competing, more viable, deliverable schemes in equally needy areas elsewhere in (say) Sandwell or Wolverhampton. The land value gradient, generally speaking, prevents change of use to a lower value activity. For example, industrial land is much cheaper than residential because the profit margins and rental incomes are much lower. Likewise land for retail is much more expensive than residential, again because the profit margins are much higher. The prospective developer will take more risk, in the form of higher site purchase cost, with the expectation of greater profit. Once the change has been made from (say) farmland to industrial, industrial to housing, housing to retail, it almost never goes back. Comparing land values is difficult as commercial rents are not directly comparable to residential land value, but when I was last in the know, typical retail land values were approximately ten times as high as residential, which in turn was about two or three times as high as industrial and 100 times agricultural land values. While the current owner clings to retail hope value and is unable to write off an asset, which may be underpinning borrowing, and sell at considerable loss (at what is perhaps true market value), I fear the situation will persist for many years to come. mmmmmmm……. interesting discussion topic (Well what else would you expect from this blog?) Thankfully there has been a lot of work in Brownhills over the last few years to rejuvenate the area, the new flats /apartments in Catshill by the Anchor Bridge, what was Wessex Close and also Short Street have work proceeding, love it or hate it “Silver Waters” and the proposal to build more houses and flats etc on the land behind Silver Court etc. Ravenscourt and the surrounding area are now sticking out like a sore thumb even more than before and will continue to do so until something is done about it, in reality I have no idea or knowledge about how that could be done but in an ideal world I’d like to see it flattened and started again. I wonder why Vivienne didn’t reveal at the time, that she is standing as a councillor in the local elections this May, when she wrote into the paper? Is it because she didn’t want to alert the electorate to the fact that her “idea” is actually someone else’s and has already happened? I am really pleased Bob that you have offered Vivienne the opportunity to explain in more detail her thoughts and plans about how to potentially proceed with a compulsory Purchase order, becuase on the face of it it might appear to some people that Vivienne is simply exploiting a situation for her own benefit and not for the greater good of Brownhills? I’ve been into Brownhills a number of times over the last few days, especially in the Ravenscourt area hoping to see someone with a clipboard asking me some questions and asking me to sign a petition but sadly I have missed them, any chance Vivienne could tell us when she will be there next as I’d like to sign her petition.